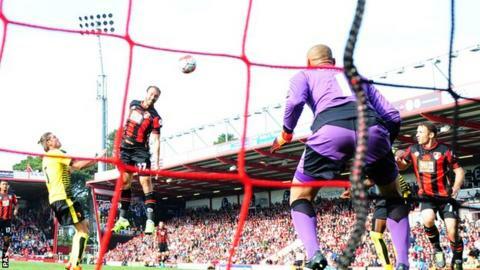 Glenn Murray scored and had a late penalty saved as Bournemouth were held to a home draw by Watford. Summer signing Murray, replacing the injured Callum Wilson, nodded in a Matt Ritchie cross to put the hosts ahead. Watford were gifted an equaliser when Cherries goalkeeper Artur Boruc passed to Odion Ighalo, who side-footed home. Bournemouth were awarded a penalty for Etienne Capoue's foul on Adam Smith, but Murray's effort was pushed away by Hornets keeper Heurelho Gomes. Although Boruc's error and Murray's miss will frustrate Bournemouth boss Eddie Howe, his side did survive a Ben Watson half-volley hitting the crossbar. Bournemouth beat Watford to the Championship title by a point last season, but this was the third draw in their past four meetings. Murray shouldered the burden of scoring for his side with Wilson ruled out for six months after suffering a knee injury last week. The £4m signing from Crystal Palace missed a close-range header at the far post from a Ritchie cross before atoning with his opener. After Ighalo had equalised, Murray - a constant aerial threat throughout - headed just wide from among a crowd of players. The 32-year-old had no hesitation in taking the 85th-minute penalty, only to see it saved. Howe said: "No blame attached to Glenn. He was excellent and he was the heartbeat of most of what was good about our team. "He's a totally different player to Callum Wilson. He brings different strengths and we're going to have to mould ourselves around Glenn as we did with Callum. "We tweaked things slightly but we were still very effective." Bournemouth looked like they were heading into half-time with a deserved lead before Boruc's blunder. After controlling a Sylvain Distin backpass, Boruc gave the ball away to Ighalo, who shimmied past the Cherries keeper to score his fifth goal of the season. Hornets keeper Gomes, by contrast, played a key role in earning his side a point. The Brazilian acrobatically tipped over a superb 18-yard overhead kick from Cherries defender Steve Cook and dived to his left to save Murray's late spot-kick. Bournemouth manager Eddie Howe: "There's no blame attached to Artur - we encourage our players and our goalkeeper to take responsibility and play from the back. "It was just unfortunate with the timing of the goal. If Steve Cook's overhead kick had gone in, we'd have been talking about it for years to come, but Gomes has got a hand to it, and then he makes a top-class save for the penalty." Watford boss Quique Sanchez Flores: "We have given away two penalties in the last two matches. We have to find a balance between defence and attack. "We had scored only six goals so everyone knows how important Gomes it to us - he is a leader. I thought the overhead kick was a goal, then he saved the penalty." Bournemouth face a trip to Manchester City on 17 October after the international break, while Watford host Arsenal the same day. Match ends, Bournemouth 1, Watford 1. Second Half ends, Bournemouth 1, Watford 1. Attempt missed. Almen Abdi (Watford) right footed shot from outside the box is close, but misses to the left from a direct free kick. Attempt saved. Eunan O'Kane (Bournemouth) right footed shot from the left side of the box is saved in the centre of the goal. Assisted by Andrew Surman. Glenn Murray (Bournemouth) wins a free kick in the attacking half. Offside, Bournemouth. Simon Francis tries a through ball, but Glenn Murray is caught offside. Offside, Bournemouth. Charlie Daniels tries a through ball, but Matt Ritchie is caught offside. Attempt missed. Dan Gosling (Bournemouth) left footed shot from outside the box misses to the right following a corner. Penalty saved! Glenn Murray (Bournemouth) fails to capitalise on this great opportunity, right footed shot saved in the bottom right corner. Penalty Bournemouth. Adam Smith draws a foul in the penalty area. Penalty conceded by Etienne Capoue (Watford) after a foul in the penalty area. Attempt saved. Steve Cook (Bournemouth) right footed shot from outside the box is saved in the top right corner. Assisted by Dan Gosling. Matt Ritchie (Bournemouth) wins a free kick on the left wing. Foul by Víctor Ibarbo (Watford). Attempt missed. Glenn Murray (Bournemouth) header from the centre of the box is close, but misses to the left. Assisted by Simon Francis with a cross. Substitution, Watford. Juan Carlos Paredes replaces Ikechi Anya because of an injury. Delay in match Ikechi Anya (Watford) because of an injury. Attempt missed. Odion Ighalo (Watford) left footed shot from outside the box misses to the right. Assisted by Almen Abdi. Attempt blocked. Matt Ritchie (Bournemouth) left footed shot from outside the box is blocked. Assisted by Andrew Surman. Substitution, Watford. Víctor Ibarbo replaces Nyom because of an injury. Substitution, Bournemouth. Eunan O'Kane replaces Joshua King. Attempt saved. Glenn Murray (Bournemouth) right footed shot from outside the box is saved in the bottom left corner. Assisted by Charlie Daniels. Corner, Watford. Conceded by Artur Boruc. Attempt saved. Ikechi Anya (Watford) left footed shot from the left side of the box is saved in the bottom right corner. Assisted by Almen Abdi with a through ball. Attempt blocked. Ben Watson (Watford) right footed shot from outside the box is blocked. Nyom (Watford) wins a free kick on the right wing.